Autumn comes to Dubai and is not, as in England my country of birth, the season of mists and mellow fruitfulness, with blackberries and sloes weighing down the hedgerows, leaves turning golden and the scent of wood smoke in the air. Instead there is a slight lowering of the air conditioning, the realisation as you step outside that your sunglasses have not steamed up, deep red sunsets, a sense of promise for sitting outside long into the evening for many months to come and piles of pomegranates in the supermarkets. Today I had the choice of fruit from four countries and due to curiosity and indecision, while ably advised by the assistant, I bought three different kinds. The ones from India were small and deep red, the Spanish ones paler and oddly described as seedless, Yemen yielded huge yellow globes which I would have avoided but the man said these were the sweetest. He also said that the Egyptian pomegranates were sour, so they stayed on the shelf. These might have been the variety that is used to make pomegranate molasses, a sweet and sour condiment used across the Middle East in cooking. 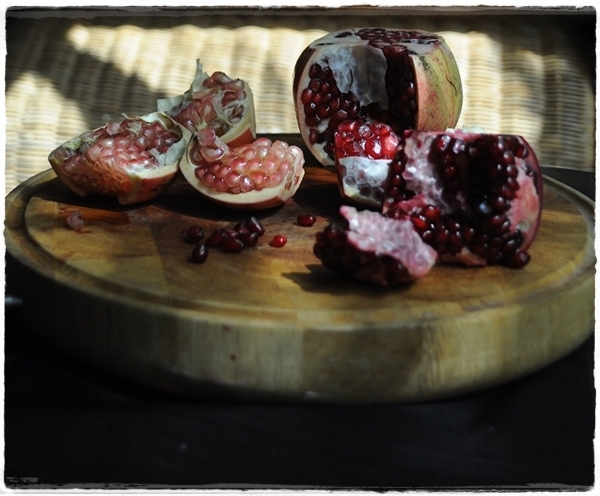 As a child, a pomegranate was the most unusual fruit I ever ate and seemed highly exotic. My mother bought them about once a year and, in retrospect, I have to wonder why. She wouldn’t have dreamed of buying a mango or a pineapple. They were cut in half and we were given a pin to eat them with – which seems both impractical and pretty dangerous with hindsight. However, no tongues were pierced but I think we got bored with eating them quite quickly using this laborious method. Nigella Lawson advocates cutting a pomegranate in half and then whacking the shell with a wooden spoon so that the seeds rain down. While this does produce a few pretty promptly, it also sprays juice in all directions, damaging the juicy globules. My preferred method is best done when you are not in a rush or have a few willing helpers. It doesn’t take that long but does require a gentle touch and a bit of patience. It’s quite therapeutic sitting in a quiet kitchen, Radio 4 in the background, easing the glittering bounty from its shell, pith and membrane. First, cut a thin layer from the top and the bottom of the pomegranate to expose the seeds underneath (try not to cut into them if possible). With a sharp knife make eight equal cuts down the sides through the skin, following the line of the pith if you can (you can see that I didn’t always!) You will feel a soft resistance to the knife when you have cut all the way through the leather-like skin. 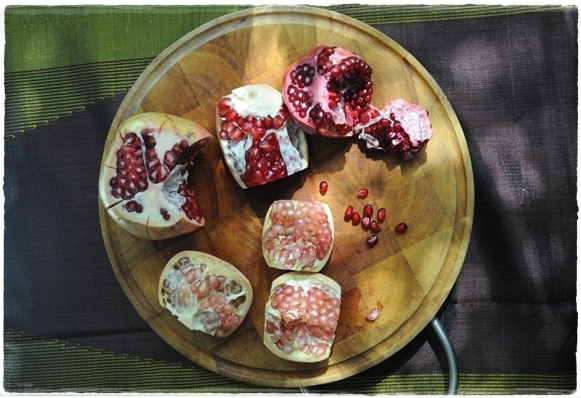 Grasp both sides of the pomegranate and break in half gently. Separate the other wedges equally gently. Do this over a bowl or tabletop as the seeds will start to fall out. Carefully remove the pith, membrane and skin from each section letting the seeds collect into the bowl, teasing any stubborn ones out by bending the skin. 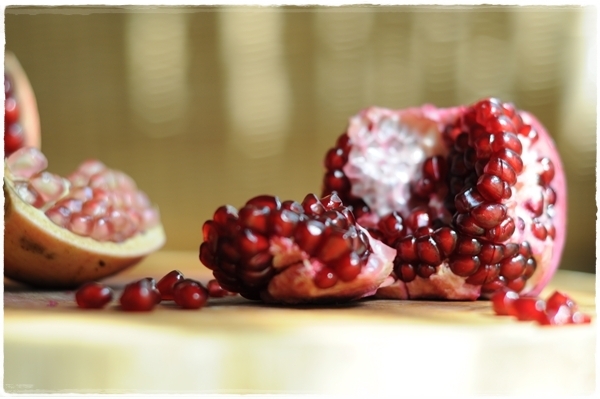 Using this method will result in a heap of jewel-like pomegranate seeds completely free of pith, juice intact. By the way, the man was right – the pomegranates from Yemen were the sweetest. Scatter them over salads. They are especially good with bitter leaves. Stir them into a raita with yoghurt, salt and spring onions. Use them as a garnish for fish in a tahini sauce (or over hummous). Sprinkle over the top of a trifle – this is great around the festive season. Cut deseeded cucumbers into small dice and mix with the seeds, sea salt and a squirt of lime juice. Bake some quinces (if you are lucky enough to find some), spoon on some clotted cream and strew with pomegranate seeds. Combine with dried apricots (soaked overnight in orange juice and simmered until tender), dates, segments of fresh orange and a little bit of orange flower water for a winter fruit salad. Serve a small bowlful with a cheese board (instead of the usual grapes). Make a pomegranate sauce. Put the seeds from 4 pomegranates into a blender for a few seconds then strain the liquid (about 300 ml) into a pan. Add the juice of 2 lemons, a tablespoon of sugar, 150ml of water, salt and pepper. You could add some browned joints of duck, sauted onions and some walnuts and simmer gently for at least 1 hour until very tender. 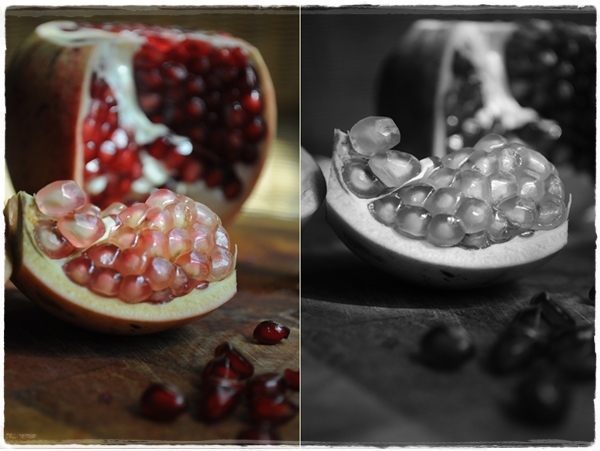 It was great fun taking these pictures of pomegranates and as the colours are so rich and sumptuous it might seem odd to take the black and white ones. However, the shapes are so sculptural though and in monochrome they are transformed into something other wordly – almost alien like! It was the nightingale, and not the lark, that pierced the fearful hollow of thine ear. Nightly she sings on yon pomegranate tree. Juliet, Act 3, Scene 5, Romeo and Juliet. 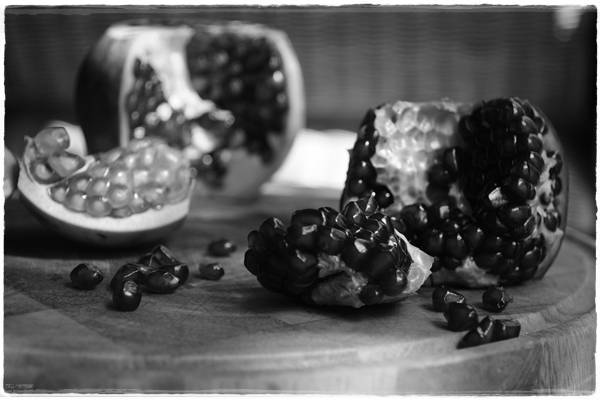 I’m sharing this for Black and White Wednesday run by super-talented photographer Susan over at The Well Seasoned Cook and with Ren for Simple and in Season at Fabulicious Food. What says ‘Autumn’ to you? Have you got any other uses for pomegranate seeds? I always enjoy hearing from you. Beautiful photos, Sally! I’m a recent convert to pomegranates, and I have to say the “thwacking” method of Nigella’s never worked for me either. I froze the seeds when they were in season last year, and they’ve been fine defrosted on salads and over couscous, as you suggest. Interesting to see the different coloured seeds! Fab photos – I think you got quite carried away! Very interesting post. I had no idea there were so many different types of pomegranate. I just thought the differing colours were a seasonal difference. My preferred method of getting the precious seeds out, with the minimum damage, is the ‘Nigella method’ (I didn’t learn it from her though), but with a pre-cutting roll along the countertop. It will make some horrible crunching noises as the seeds detach but the seeds do fall out easily without too much admittedly therapeutic whacking. It’s definitely the quick way – but I managed to squirt juice all over my husband last weekend using this method!! I agree Sylvie – they all taste different too. How interesting. Very useful post. I’m going to try your cutting method. I eat pomegrante nearly every day. Lovely photos. I find they are easier to eat when there’s a bowlful of fresh seeds waiting for me to dip into – and helps get more of the ‘five a day’ into the family. Sally i loved this entry!! Beautiful pictures and nice read! I love the photographs! So amazing. They remind me of some of Vermeer’s work for some reason! Cheers Sid – I was pleased with the way they came out with a sort of painterly quality to them. In India, we just eat the seeds and that’s that. Yes I thought the ones from India would be sweet and there were, but the Yemeni ones were just a little sweeter and very juicy. Wow, beatutiful pictures and good advice. I use it inside a glass with champagne, very elegant for a party. That’s a great idea Marica – you’ve just made me think of pomegranate martinis which I had in Istanbul. This is my gravatar and logo! It’s sad how things that are good for you seem to be so much more expensive than the unhealthy stuff! A very interesting post! Here we get Spanish and Israeli pomegranates. Wow! Thanks for sharing Sally! What a lovely post. I really thought that the Indian ones would be the sweetest. Maryam LOVES pomegranates and we usually mix it in with her Dora yoghurt pots! Just finished one now actually. My preference has always been for the Indian ones- they are so sweet and juicy. Thnaks for all the other ideas. I got the Yemeni ones in Union Co-op – they are worth a try. I think Maryam would approve! Random font curiosity: was that Viner Hand ITC in the image with the seeds from different countries? Well spotted – absolutely correct on the font! 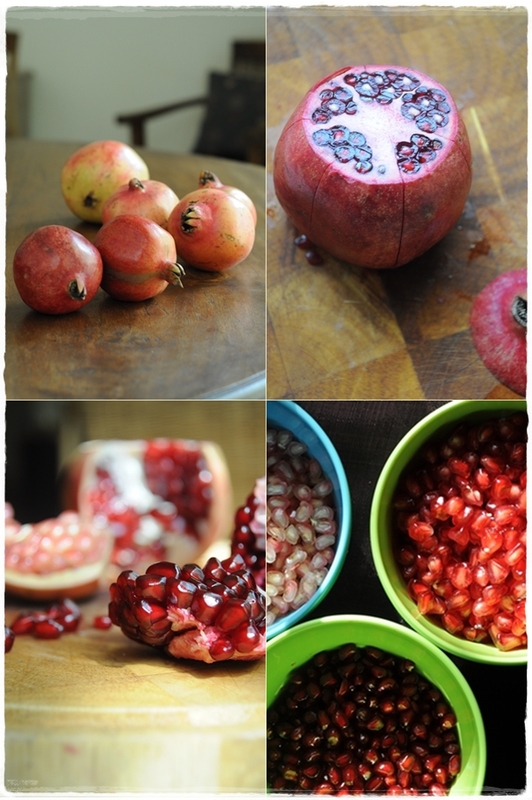 How beautiful the pomegranate is and your photos illustrate that perfectly. I feel inspired! Oh believe me I do – and it looked like such fun. This is a fabulous post, I was fascinated from the very first photograph. It’s interesting to see the difference between pomegranates from different origins, they look like tiny jewels in the bowls. Even though I had a pomegranate tree in the back yard of our last house, I never did much with them because I never knew the technique for getting out the seeds. I love your close-ups, the fruit really does have an alien quality to it! I love their jewel-like quality too. How wonderful to have a pomegranate tree in your garden. You said pomegranate molasses and my mind wandered off to when mom puts a good dollop of it into our salads every once in a while; tastes divine! I know what you mean about removing the seeds as being therapeutic. It’s a wonderful feeling. Love your photos Sally, they are beautiful! There seems a strange lack of pomegranate molasses in the shops at the moment. I like it on salads too. Intoxicating photos, coupled with a pomegranate education for me! I have never seen the delightful rose colored Spanish pomegranates before. My mom would give us each half a pomegranate and send us out outside to eat. When finished, she would clean us up at the back door prior to our reentry into the house. No instructions were given! Thank you again for the irresistible photos. We were banished to the garden to eat a lot of things too! You’ve made my day with this comment Ozoz – I’m still on a journey with photography. And Oh my God……I’ve written down things I’m observing about life around the equator. One of them – my glasses misting over and castling a silver pall over everything once you move from air conditioning to the warmth of the outside!!!! you must be extremely observant (does that mean I am too :-)?) anyhow, thanks for sharing. Wow – gorgeous photo’s love the post and very interesting! Beautiful photos! I was not aware of the different varieties! I learned something new here and all those great ideas for incorporating the seeds!! Thanks for sharing this! Extremely interesting and useful post! And all those ways to use pomegranate seeds – I knew neither of them. Last year I bought a pomegranate for the first and the last time. First of all I had great troubles deseeding it, then I decided to make pomegranate molasses with it but it turned out very sweet and sour at the same time. Made some cookies with it but it was a torture to eat them. Then I told to myself I’ll never buy this thing again, but after reading this I definitely want to try it again. Pomegranate molasses is traditionally sweet and sour (and made from a sour variety of fruit). I can’t tell you how many of them we’ve eaten this week – so easy to eat when there are little bowls of seeds just waiting in the fridge. Thanks fore that very informative. I India street vendors squeeze the whole fruit in one hand over a glass to sell. Wow – they must be very skilled (or absolutely covered in juice). Thanks for the nice comment Peter. Beautiful photos, Sally! I adore pomegrantes. We used to get one or two a year too, when I was a child. Another use: scattered over freshly fried Chiles Rellenos (stuffed chiles). Love the idea of putting the fruit into raita. Must try that soon. I’m off to look up Chiles Rellenos right now – sounds excellent. Stunning collection of shots. I had a hard time deciding which B/W to choose. Thanks, Sally, for joining in BWW! 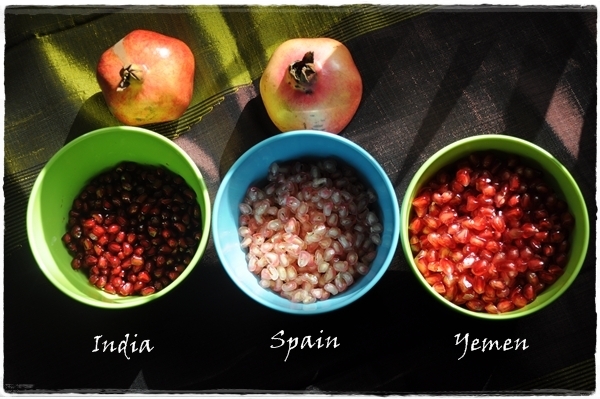 I am such a naive little thing that I truly had no idea that there were different types of pomegranate from different countries….this post has been a true education. One of my favourite recipes is actually from Ms Nigella and is a warm lamb salad with the pomegranates sprinkled over at the end for little jewel-like pops of deliciousness. Thank you for joining Laura’s ‘POM’ club as it has enabled me to discover you. I joined from the POM from HHUK and I’m am so inspired by your photography, writing and instructions. Beautifully done. So glad you joined in the party so I could visit. Thank you – what a really lovely comment. 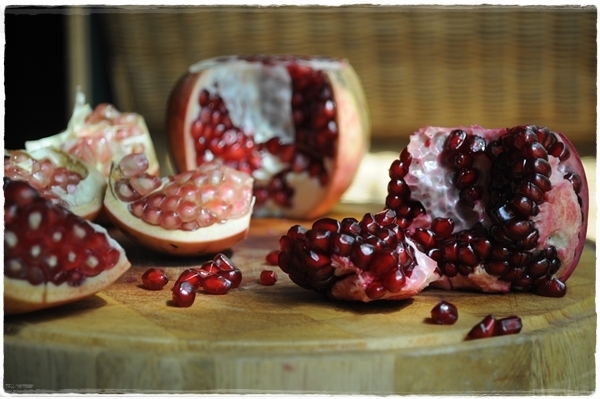 I have always been curious about pomegranates, but (true confession) have never eaten one! For someone who is not familar with them, the packaging can be a little intimidating. After reading your post, I may have to finally try them.